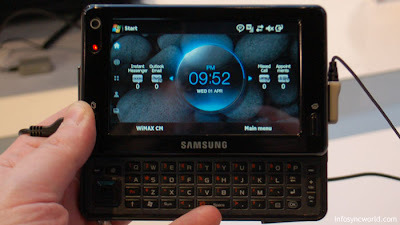 Samsung's Mondi is a WiMax and Wi-Fi MID that uses Samsung's TouchWiz UI on the Windows Mobile 6.1 platform. The device has 4.3-inch screen and slide-out QWERTY keyboard, and comes with Opera 9.5. Looks OQO-ey! The Mondi has 4-gigabytes of internal storage, GPS, Push email, a 3-megapixel camera (w/ video support), Bluetooth 2.1 and HDMI out. It supports various video and audio codecs, plus an assortment of instant messaging platforms. Despite having a microphone, voice is not supported on the device, so VoIP or cellular calls are out of the question. However, MMS is available. I didn't have tons time to play with the Mondi, but the build quality seemed pretty high, and the device was lighter than I expected it to feel. The screen had a bright, crisp look to it, and was reasonably responsive when the TouchWiz UI was present. The Keyboard was laid out nicely, so you could distinguish each key from each other and avoid typos. WinMo 6.1 starts to rear it's head once you get past the first UI layer, but the hardware was powerful enough that it ran pretty well. The WiMax wasn't turned on (obviously), so I couldn't test that, but I'm looking forward to seeing how it performs in speed tests. LAS VEGAS – March 31, 2008 – Samsung Telecommunications America (Samsung Mobile) today announced the upcoming availability of the Samsung Mondi™, the most advanced mobile WiMAX enabled handheld device in the U.S. The touch screen Mondi, which takes its name from the Latin word for "world", is designed for use with the Clear™ mobile WiMAX service from Clearwire. The Mondi carries many of the powerful features and uses of a laptop computer or netbook, but its compact slider form factor easily fits into the hand or pocket. GPS Navigation provided by Route 66 adds to the Mondi's versatility. Available in a solid black finish, this device extends horizontally to reveal a full QWERTY keyboard and optical mouse. The Mondi™ is packed with multimedia features that offer instant access to E-mail, Internet, video content and business applications. Mondi packs a full -featured web browser, powered by Opera 9.5, which takes full advantage of the device's 4.3-inch touch screen. To keep connected while on-the-go, Mondi offers best-in-class location based services and instant access to social networking websites. It also supports various services including Fring™, Gypsii™, and MS Live Messenger. The Mondi is completely customizable, thanks to a set of widgets that can be dragged and dropped anywhere on the display screen for easy viewing and use. Mondi is also an excellent device for work or for play. WiFi connectivity offers the business user fast and simple connections to Outlook Email / Calendars, Microsoft Office and many other vertical business applications outside the Clear service area. For the multimedia user, this device offers the ability to download and watch movies, listen to music or play games. "The Samsung Mondi is an important step toward our goal of bringing 4G network speeds and connectivity to people across the U.S.," said Bill Ogle, Chief Marketing Officer for Samsung Mobile. "The Mondi™ is a great match for people who want immediate access to the Web without having to sacrifice download speed and portability." "The mobile broadband experience that the Mondi offers to Clear customers places the power of the open Internet in the palm of the hand," said Atish Gude, Chief Marketing Officer for Clearwire. "As our network grows across the US, we will continue to work with innovative device manufacturers to expand the mobile WiMAX device ecosystem and leverage the value that a 4G wireless Internet connection delivers." Samsung is the global leader in delivering mobile WiMAX technologies and offers an end-to-end solution including chipsets, infrastructure, mobile devices and consumer electronics, including devices capable of accessing both mobile WiMAX and other wireless technologies. UQ Communications in Japan and Scartel LLC., in Russia are examples of other Mondi (tm)ing operators preparing for significant commercial deployment of national-wide service using Samsung's mobile WiMAX total solution. Clearwire currently provides mobile WiMAX service in Portland, Ore. and Baltimore, MD.. The company expects to bring the service to more than 80 markets by 2010. Some of the major markets expected to launch Clear service this year include Atlanta, Las Vegas, Chicago, Charlotte, Dallas/Ft. Worth, Honolulu, Philadelphia, and Seattle.